We have been trying for months to get someone, ANYONE, from the event coordinators, to town officials to take our meeting request to no avail. We figured that if the day ever comes that we are granted a meeting, we should at least be prepared to discuss the event from a standpoint of actually having been to one. As we arrived, the kids were surprised to see all the family activities being offered on the grounds. They had various rides and activities for kids. 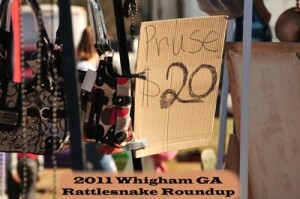 There were plenty of vendors selling goods and lots of food stands available. The first thing we did was to stroll over to the famous Snake Ring. 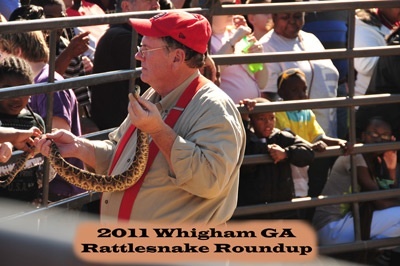 This is an area where spectators can gather around an arena and gawk at the various snake pens strategically placed around the arena. Each snake pen held about 4-to-10 snakes and they were all obviously agitated. In the pit, there were several folks walking around with snake sticks and from time to time they would find one of the more aggressive looking snakes and take them out and place them on the ground for everyone to see. They would continue to prod and poke at them in an attempt to get them to strike for the audience’s pleasure. While this was going on, we noticed a rather large individual walking around with one medium-sized snake in his hands, and allowing the folks to reach in the arena and touch the snake on its tail end. We noticed that he had a very secure grip on the snake’s head and neck which prevented the snake from having any opportunity of moving (or even being able to breath normally). It looked quite painful. When Olivia noticed how this person was holding the snake, she asked me how the guy would feel if someone was to hold him by the neck and squeeze tightly and parade him around the arena for 40 minutes like he was doing. As this person was getting closer to where we were standing, Olivia asked if she could push to the front. When I asked her why, she told me that she wanted to tell him how ridiculous it was for him to squeeze so tight on the poor animals throat and how she wanted to tell him that she thought he was a bad person for doing what he was doing. I told her that the guy obviously did not care much for animals and that if she said something now, it might make it more difficult for us to ever get a meeting with the town or the organizers. Both Carter and Olivia were having a hard time watching this spectacle any longer and they asked if we could leave. We headed back up to the rest of the grounds where the vendor stands were and allowed the kids to try and have fun with the rest of the day. 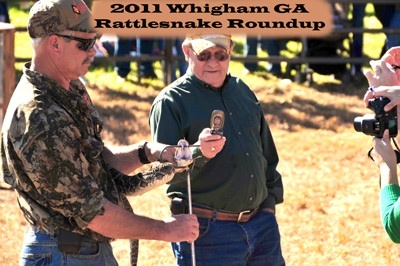 I feel that the event was set up in such a way that allowed folks to come and bring their families, and with the exception of the fact that all these snakes were breathing their last breath, everything else about the event seemed normal. It is extremely unfortunate that as a community, or even our society, we haven’t realized that even snakes deserve to live and be left alone. 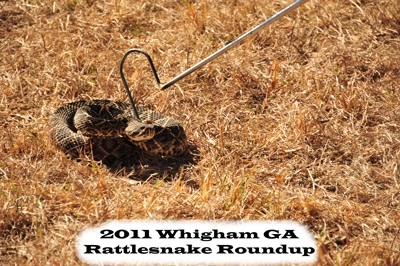 These events remove hundreds and even thousands of snakes from the environment and the organizers obviously do not yet see the consequences of their actions. It was funny, we were asked to give an interview for a local newspaper while we were at the event . The reporter was a nice enough lady. She was there with her mother visiting the event and doing some work at the same time. As this young lady was interviewing Carter and Olivia, my wife had an opportunity to ask the reporter’s mom what she thought of the event. The lady commented that she had no problem with the event but did not necessarily agree with the eventual killing of the snakes. She continued by saying she doesn’t have a snake problem, she has a problem with her property being overrun with rats. My wife quickly asked her if she felt that the annual snake hunting and eventual slaughter of all these snakes had anything to do with the overabundance of rats. My wife said you could actually see the “light go on” as this kind lady realized that the snakes, which were being captured and killed, were some of the ones who normally kept the rodents in check. So as we left, we were pleased to see that the event organizers did not have stations set up where the snakes would be publicly slaughtered and skinned. 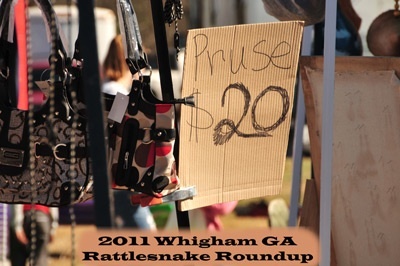 It was ironic to hear the folks in the Snake Ring as they peppered in a few snake safety tips to the public, hear them boast that all snakes were humanely handled, and that all snakes were going to be sold to other vendors after the event. Very often events like these kill the snakes after the event is over, so we were dubious of the claims of what would become of the snakes. Snake hunters all too often pour gasoline in the burrow of the Gopher Tortoise to drive the snakes out. Unfortunately, they show little regard to the over 300 other species which also use these burrows as their home. Many of which are are merely written off as collateral damage. BTW, it is proven that you are 6-times more likely to be struck by lightning, than to be bitten by a snake, any snake. Don’t kill the snakes… please ;-( Do you see how much it hurts me when you and others kill the snakes? Why does your group kill snakes? Did you know animals help us and we humans do nothing but harass and kill them? Why don’t you help them? Why… can you tell me? Are you pussycats! Are you scared of snakes or is it for money that you do this to snakes? These animals are God’s creatures. God’s forgotten creatures. If you would like to voice your opinion or show your support, you can do so below. Donations are always welcome and all letters/comments we receive will be added to our growing stack of signed petitions asking for these event to be changed from a Roundup to a Animal Festival where no snakes are allowed to be caught for the event. Instead, organizers will use the opportunity to educate the public about the value the species has on our environment. So far, Carter and Olivia have collected over 1,200 signatures on our petitions. We would like to thank the folks from the town of Whigham GA and hope they will agree to meet with us soon.